Pamper yourself and get the full experience, feel relaxed and looking your best with the complete spa package. Treat yourself to one of our foot spa experiences in the comfort of your own home with our luxurious foot spa. Experience our cosmetic beauty treatment for your fingernails and hands performed in the comfort of your home.The manicure consists of filing and shaping,massage of the hand and the application of polish.We can also include nail art for you. Our Pedicure will improve the appearance of your feet and nails.Pedicure can be done for such reasons as cosmetic, therapeutic and medical purposes.It's an extremely popular package. Our manicure and pedicure will leave your hands and feet looking great! Ear Candling is an alternative medicine technique to clear wax and other debris from the ear.It is a safe, simple and relaxing remedy for many ailments, including sinus pressure, ear ache, migraine, ringing in your ears(tinnitus) and even stress. Foot Reflexology is an alternative medicine which involves the application of pressure to specific points and areas on the feet. These areas and reflex points correspond to different body organs and systems,and that pressing them can enhance your health and reduce everyday stress. It is appropriate for all ages and a variety of ailments and can also be used as a complementary therapy for conditions like diabetes, anxiety, migraine, asthma, headaches and cardiovascular issues. 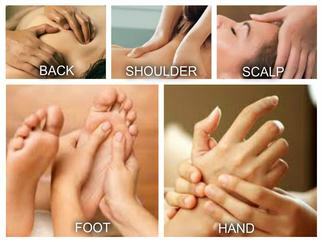 Have a relaxing foot spa with all the benefits of receiving foot reflexology. A great package to boost your general health and well being. Shiatsu means finger pressure and works very similarly to acupuncture by focusing on key pressure points.Your shiatsu massage therapist will remove unnecessary toxins that cause stress to revitalize your health. A highly effective and uplifting massage using stretching and kneading to release toxins. Helps to relieve joint pains, increase blood circulation and eliminate toxins. This deeply relaxing massage leaves you a feeling relaxed or revitalized depending on your needs. Your therapist will work on your entire body, including the face and scalp, to evoke and stimulate the body's natural ability to repair and heal. After the treatment, your skin will be left feeling nourished and cared for and you will have a sense of of replenishment and relaxation. Thai Herbal Compress is phenomenal for relieving muscle soreness and respiratory ailments. The blend of traditional Thai herbs contain special species of herbs like dried yellow ginger, keffir lime leaves, plai, tumeric, lemongrass which are known for their therapeutic values. They have anti-inflammatory qualities which soothe tired and tight muscles. The herbs also have therapeutic value for the softening the skin, increasing energy, enhancing immunity, increasing circulation and easing sinus and upper respiratory congestion. Along with all the benefits of the herbs the treatment is hot and moist. This means it is a deeply relaxing therapy which helps reduce the negative impact of extreme stress, exhaustion and overwhelm. The compresses also release essential oils that provide heavenly aromatherapy. We are using Green Seaweed powder accompanied by oil for this package. Green Seaweed is the healthiest plant in the planet. They have huge amounts of Vitamin A, E, C and all the B’s including B12. Green Seaweed is also good source of vitamin E, vitamin K, rich in minerals, zinc, iron, protein and complete fiber. Once you put it all over you, you’ll definitely get a healthier, glowing skin. Green Seaweed synthesizes the finest ingredients for a formula that is gentle but potent enough to imbue moisture, reduce fine surface lines, improve skin firmness and increase cell turnover. Developed with natural and organic ingredients, the effectiveness of Green Seaweed lies in its signature ingredients. This extremely powerful Green Seaweed is cloaked in proteins and other nutrients for a youthful and fresher look. Hot Stone massage is a specialty of Spiral Spa. A full body hot stone massage with light to moderate pressure. The deep penetrating heat from the black basalt stones are placed in various positions on the body for energy balancing. They are also used for specific trigger point therapy, as well as an extension of the hands allowing for long massage strokes. The heat-enhancing minerals that are part of the stones makeup allow heat to penetrate both the stones and the client’s body for extended periods of time. Sports massage is geared toward athletes of every kind, from world class professionals to weekend joggers. The particulars of the massage are specific to the athlete's sport of choice and are often focused on a particular troublesome area like knee or shoulder. Barley Whitening Scrub is made of Organic Dead Sea Salt and Barley extract, this kind of body scrub can effectively slough off dead skin cells to promote a blemish free skin while leaving it super soft and silky smooth with the whitening effect of barley for your complexion. This is suitable for all skin types as the green colored scrub is made naturally. We offer a friendly professional service and will be pleased to help you.